One of the results of our recent trip to Europe is that the good doctor and I have been considering how best to feature the great River Rhine in a blogpost. We've already posted photo albums of the recent trip there on Facebook and in Picasa, so another day-by-day account seems redundant. In the wake of our travels I read a book by Lewis Spence called Hero Tales and Legends of the Rhine, written, a tad floridly, in 1915. It combines history with tall tales, the latter only occasionally of much interest. But I began to think, "Well, why not include some of my photos (and maybe a story or two of my own as well) along with short descriptions of Spence's tales." Dottore Gianni agreed, but wondered if there shouldn't be more to it than that? It happens that I also read Mark Twain's A Tramp Abroad last month, as well as some of Johann Wolfgang von Goethe's travel journals, and other thoughts on places I'd been along the Rhine from Victor Hugo. THEN I thought (or did Dottore Gianni suggest it to me?) 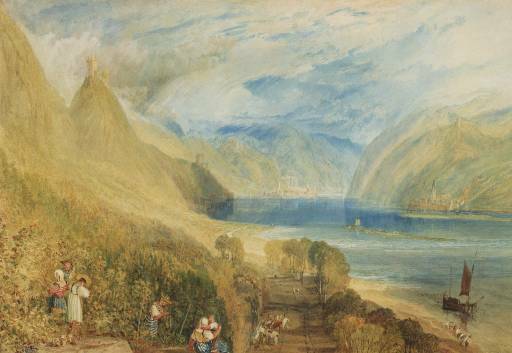 "If I place a few of those tales and quotations into the post, and perhaps throw in a few paintings by JMW Turner, along with other bits of this and that, I might create a a sort of miscellany re the Rhine, which may or may not interest my readers." We shall see, shan't we? "Nowhere is legend so thickly strewn as on the banks of the Rhine. Each step is eloquent of tradition, each town, village and valley. No hill, no castle but has its story, true or legendary...As one speeds down the broad breast of this wondrous river, gay with summer and flushed with the laughter of early vineyards, so close is the network of legend that the swiftly read or spoken tale of one locality is scarce over ere the traveller is confronted by another. It is a surfeit of romance, and inexhaustible hoard of the matter of marvel." He's right of course, but "inexhaustible?" I promise not to exhaust you with my own "hoard of the matter and the marvel." Hmmmm...I really have no business making that offer because as faithful readers know (and as Dottore Gianni complains) whether I want to or not I DO tend do go on...and on...and on. Bacharach, the lovely town of Medieval towers (one of which is shown here), old city walls (visible at right about a third of the way up the photo) and vineyards! The Rhine begins in Switzerland, passes through one of the cities I visited in that country, Basel, and as it flows down it becomes the much fought over border between France and Germany. A prime example of cities on this part of the river bounced back and forth between those two countries is Strasbourg, one of my favorite places in the recent journey; another is Mainz, in which I spent one lovely day, and of course Bacharach, my wonderful base of operations for the first few days of my trip. 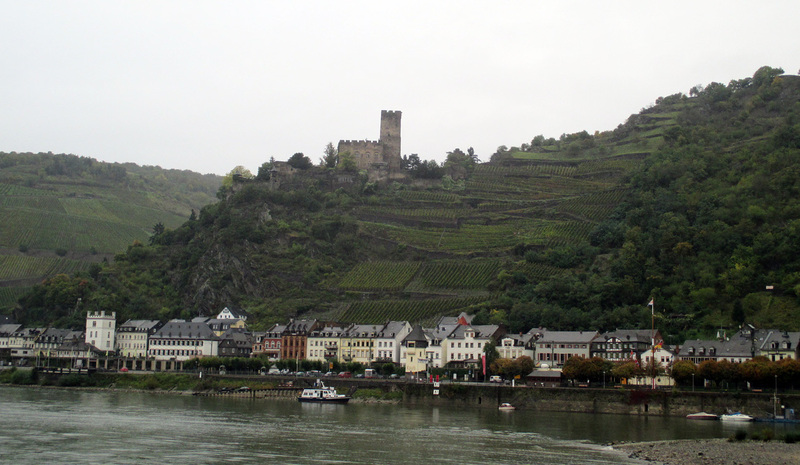 While in Bacharach I also visited Rudesheim, Bingen and St Goar, traveling by train and boat by several of the castles Spence mentions above. Lower down the Rhine is Köln (aka Cologne - the two names, one German, the other French, indicate the continous strife I noted above), where I spent a few days back in 1999. Farther down, that is farther north, the river widens in the the Low Countries and flows out into the North Sea, via canals in part, from Rotterdam and Amsterdam. 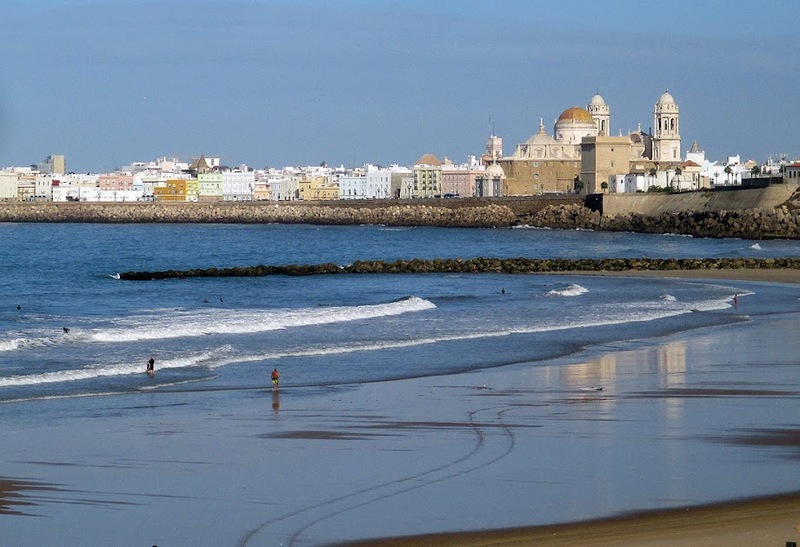 The latter city I visited in May of 2012. So you see I am connected to several parts of the mighty river by journeys past and present. The very first of my journeys I did not mention above, as it was so very long before any of them. If you read this regularly you may remember that I was a Russian Linguist in the USAF from 1966-70. Nearly two years of that time were spent in Germany, in the small town of Hof in Northern Bavaria, or as the locals prefer to call it, Franconia. I mention it because my first attempt to get to the Rhine was made during that time, on a road trip to the Nürbergring to see a car race. Three other airmen and I were thwarted, however, as one of them got so sick on our overnight stop that we had to turn around and get him to the base infirmary ASAP. 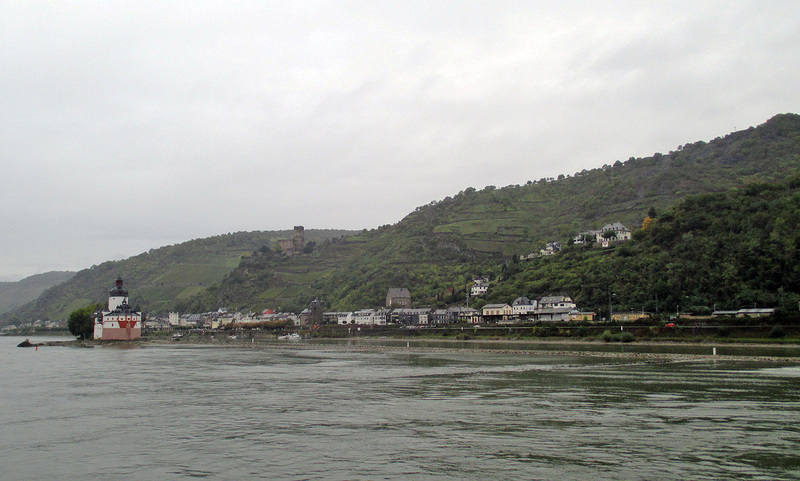 We DID see a bit the Rhine, if not the most romantic part of it, on the dreary first day of our drive. So close, and yet so far! At the very beginning of my recent trip to Germany I took a train from the Frankfurt airport to the town of Bingen (more on this city's history in a bit), transferring there to a train that took me to the beautiful village of Bacharach. Between those two places at least four castles can be seen on the hills above. I saw only one, Burg Ehrenfels, as my train was on the wrong side of the river to view most of them, but as I gazed at it from across the river on a dark and rainy morning it seemed to me a suitably Romantic beginning to my search for history, legends and castles along the Rhine. Burg Ehrenfels, dating from the 13th century, seen a bit blurred from the train window on my journey from Bingen to Bacharach,. 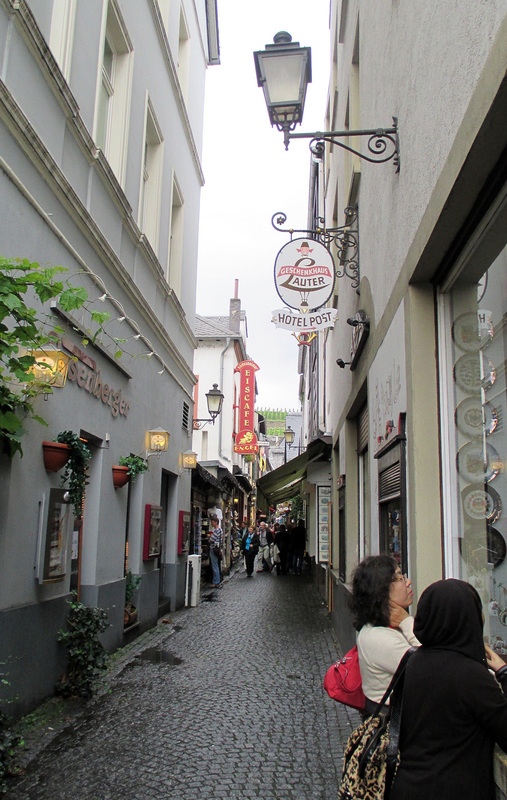 As already noted, I spent the first three nights of my journey in Bacharach, and I'll focus on that time in this post. 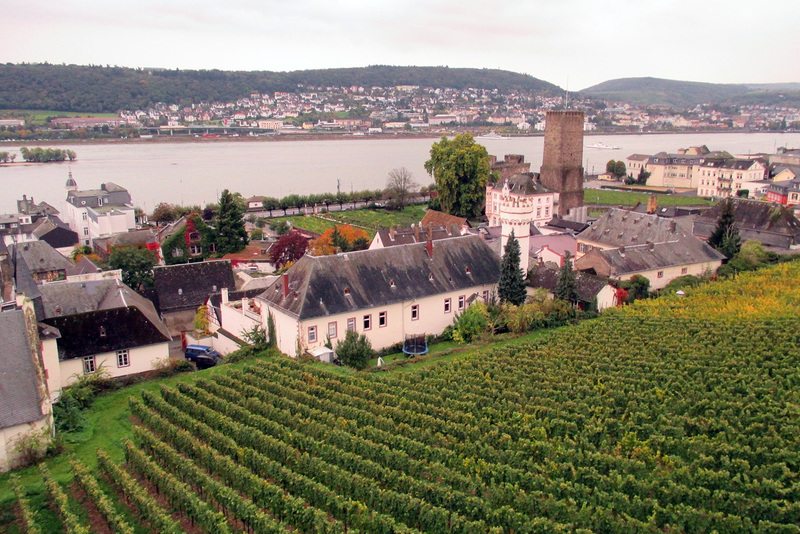 This wonderful town was a powerhouse in the Middle Ages, one of several villages on the Rhine that grew rich in that as the fields above the river proved perfect for agriculture, and more importantly for viticulture (fields of grapevines, which of course lead to wine, or as the Germans call it "wein." Bacharach, like the other villages built castles and defensive walls to protect their cities and their crops also to collect tolls from those who passed by. In the early seventeenth century many of these castles became ruins as a result of battles on the Rhine in the Thirty Years; War, which pitted Catholic against Protestant. The history of war and religion goes together all too frequently, I fear. Later the French took the area (first Louis VXI, then French Revolutionaries, and finally Napoleon. When that fierce warrior finally met his Waterloo, the Germans took it again, and in the early nineteenth century it was more or less re-branded as the quintessential Germany, its ruined castles and beautiful vine-clad hills a must-see area for those Europeans wealthy enough while taking the Grand Tour. 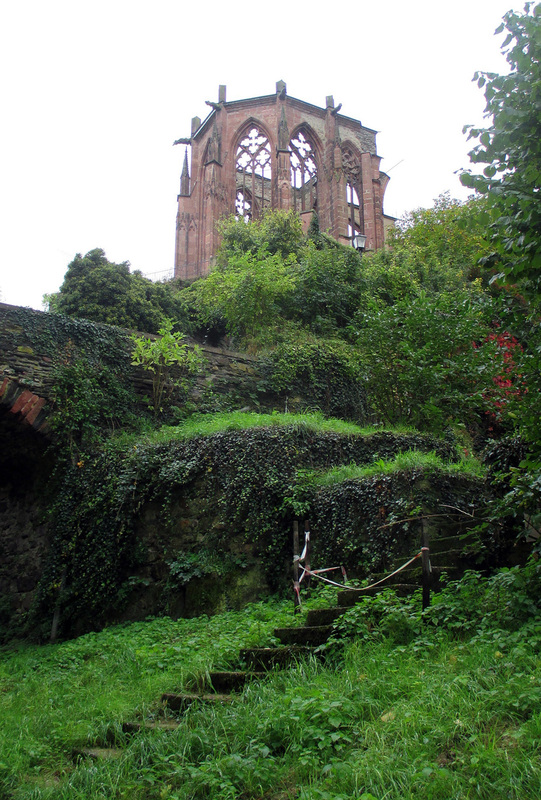 Like most other places in the region Bacharach is home to a castle, Burg Stahleck (now a youth hostel, with better views over the Rhine than any hotel or B&B in the town) and a ruined chapel (the Wernerkapelle) on the hillsides above it. Bacharach also retains some of its medieval walls as well as several medieval towers. Even though the weather was very, very dreary, I fell in love with the place and am already, a mere two months later, eager to return. I am not the only one who celebrates the place. Victor Hugo, arguably one of France's greatest writers, wrote of the Wernerkapelle, as he saw it: "No doors, no roof or windows, a magnificent skeleton puts its silhouette against the sky. Above it, the ivy-covered castle ruins provide a fitting crown. This is Bacharach, land of fairy tales, covered with legends and sagas." This painting dated between 1841 and 1845 offers a view of three medieval towers, Peterskirche (the white steeple left of center), the Wernerkapelle, just to the right of the chapel, and at the top right the castle. 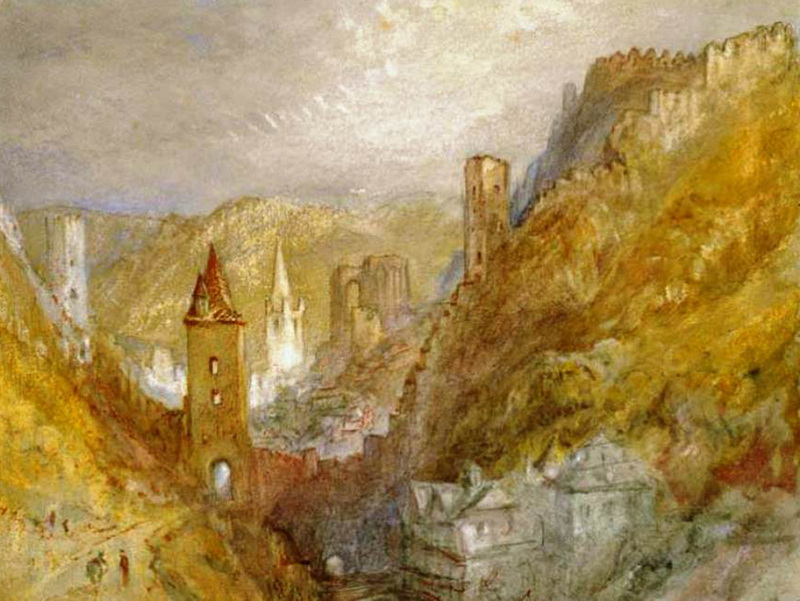 In addition to that view of the town, Turner painted Burg Sooneck, a castle (burg) 6 kilometers east of Bacharach. Now interesting mainly because of its Biedemeier furniture and paintings according the the Rough Guide: Germany, earlier on it was the source of myth along the Rhine. and in the distant background Bacharach can just be made out. Several legends are associated with Burg Sooneck, one of which is rather a grotesque one, called The Blind Archer. The Lord of the castle, so the story goes, was hosting a party and suddenly introduced his guests to a man he had imprisoned, a man of haggard appearance in general, and with two dark holes where his eyes once were. The Lord bragged to the crowd that he defeated the man in battle. Hearing those words, the blind man protested that his opponent should have dealt him a death blow, according to the rules of chivalry. The Lord replied haughtily that he couldn't be bothered, and instead had the man's eyes cut out, to keep as souvenirs, trophies of defeating the greatest archer of the region: the gaunt blind man who was standing humiliated before the brutal host and his shocked guests. The Lord mocked him, saying "The blind fellow still thinks he can hit any target accurately, by merely sensing its location." A bow and an arrow were brought in and given to the gaunt blind man, who seemed excited as he held them in his hands. The Lord then announced the target - a goblet, which the archer must aim at as soon as he heard the Lord drop it to the floor. The Lord dropped the goblet, but the archer had another target in mind. He took aim and sent the arrow straight into the mouth of the Lord, who instantly dropped dead. Avenged, the archer bowed his head, the crowd exited in confusion - thus the tale is told. 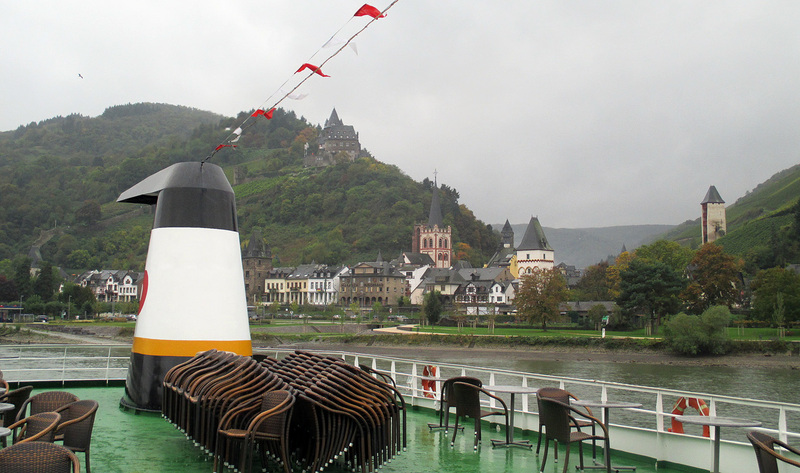 The day after I arrived in Bacharach I took a cruise on the Rhine. 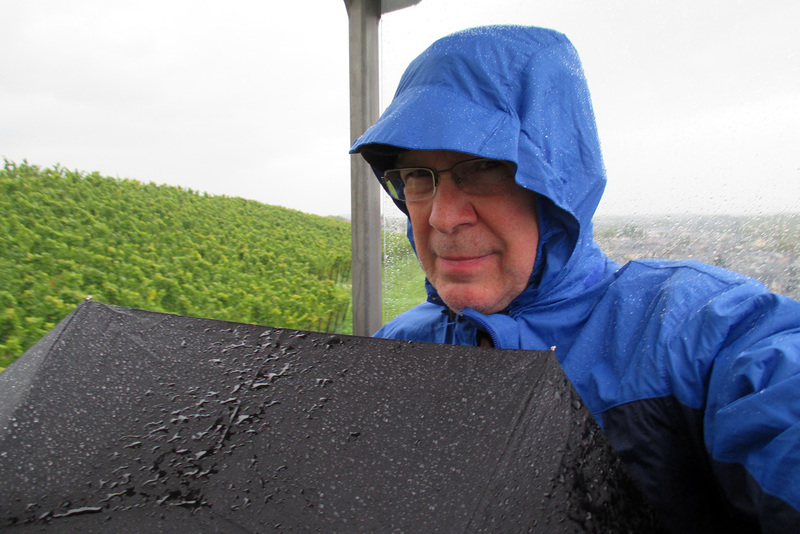 The weather was dark and rainy, but my spirits were high and I was not deterred. As a result of the weather and the lateness of the season the boat was hardly filled, the occupants including only me and a small number of very enthusiastic Asian tourists. 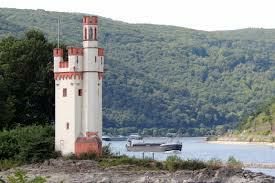 We sailed down the river for about an hour, approximately 20 kilometers, to St Goar, which is where I abandoned ship. Along the way we passed castles that I then knew little about; since the trip I have learned a bit. Some of it quite interesting! 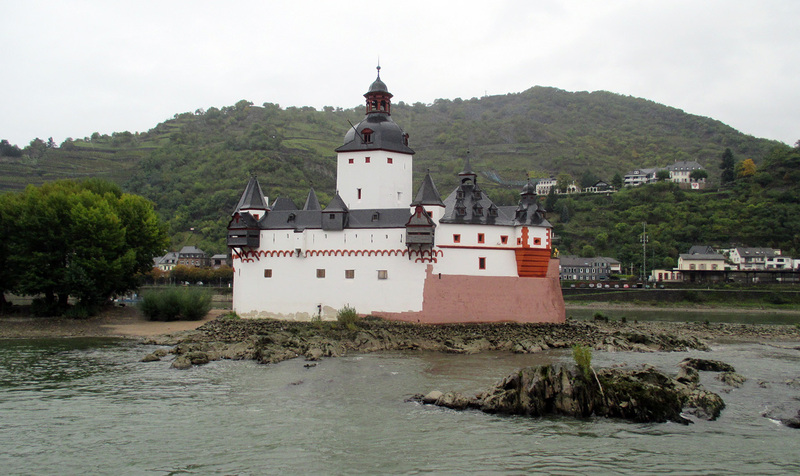 The first two castles were to be seen at Kaub, a village tinier than Bacharach. One, Burg Gutenfels, sits above the city and is now a hotel. The other, Pfalzgrafenstein, generally shortened to Pfalz (whew!) sits, unusually, mid-river. 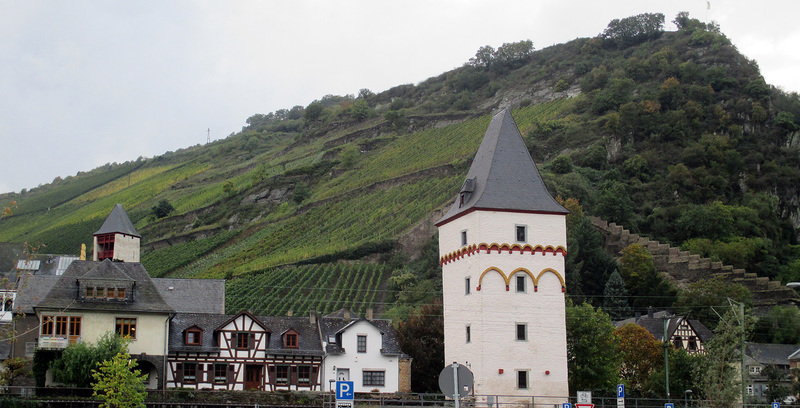 Gutenfels was built in the early thirteenth century, the Pfalz a century later. Together the two worked as toll stations for anyone who wanted to pass them, by land or river. The Pfalz in particular was perfectly placed for the job. A chain was sunk across the river there, and could be pulled up whenever a boat was spotted in either direction, trapping the boat, thus forcing its captain to pay the toll. Interestingly it is the only castle along this scenic stretch of the Rhine that was never captured - therefore never ruined. Today one reaches it by ferry from Kaub. It is now a museum focusing on the fourteenth century - the Burg remains as it was then - no electricity, no toilet - so time your visit with care! Brief yicchy sidebar: No toilet?!? So how in the fourteenth century and on down in time did one...relieve oneself? Answer the call of nature? Have a look at the two small black outcroppings on the castle. A hole placed in the bottom of each did the job! Take a seat, do your "business" and all would be washed away by the river! Disclaimer: I know that I read this in my research, but cannot find where exactly. So you must trust me, dear readers! See the two black protuberances on the wall of the Pfalz? Relief! A legend concerning the Pfalz deals with Guba, wife of a medieval prince, ruler of the area, who suspected her of infidelity and who locked her in the castle. The couple had no children, and the prince's brother was delighted, for as long as Guba remained in prison there could be no heir, so HE would inherit the throne. The brother was an evil man, unpopular among the local peasants, and unsure of his position. So he visited the Pfalz frequently to check that Guba was still trapped therein. Meanwhile, Guba's guard had become attached to her and allowed her freedom on certain days as long as she returned to the castle by nightfall. The evil brother happened to visit one day when Guba was out and about, and said something to the effect of, "Aha! She is with her lover!" Both men searched and discovered Guba nearby - with a young man! The fellow tried to escape but was caught. After a quick trial he was condemned and hanged. But as the noose was placed round his neck he exclaimed that Guba never loved him, and that while he was guilty of wanting her, she was innocent. Still he was hanged, and still she was guarded. By now six months had passed since her separation from her husband and imprisonment in the castle - and Guba announced to her guard that she was pregnant. She asked him to keep her secret, as she was confident that when the child was born it would resemble her husband and she would be freed. Alas, the son bore little resemblance to the prince, so Guba's guard and his wife quietly had the baby sent to a castle nearby, so close it could be seen from the Pfalz. The guard had a white flag hung on that castle to signal that the boy was alive and well. Guba looked for that flag every day, and many years passed in this manner, during which her husband died and his brother became the prince. But, remember he was evil and hated by the people. It was soon rumored that a young man claimed to be the son and rightful heir. A war ensued in which the evil brother was defeated and executed. Guba's son immediately came to the Pfalz to free his mother, but she was dying and pleaded with him NOT to take her to court, but to allow her to remain in the Pfalz in her final days. She could desire no more, as she now knew that her son was not merely alive but the new prince. Her wishes were granted and her brief time remaining was spent peacefully at the island castle - and that is how the tale ends. Sidebar geographical: While Spence does not mention it in his account, the castle where the son was brought up, the one that could be seen by Guba, could only be, insists Dottore Gianni, Burg Gutenfels, just above Kaub - so in a sense the preceding was a tale of TWO castles! Therefore Kaub shall, in this post, become a town of two legends! There is one told of Burg Gutenfels about the sister of the lord of the castle back in the thirteenth century lord of the castle. She was named Guta and was said to be the most beautiful woman in Germany. She was as proud as she was beautiful and rejected suitor after suitor after suitor. Her brother took her to Koln to watch a tournament of jousting. When she took her seat at the tourney the young woman attracted the attention of almost every man there, those watching the jousts and those doing battle in the lists. Suddenly there was a commotion, not about Guta. An unknown knight entered the lists whose name was not announced by the herald. It was whispered about that only the Archbishop knew who he was. Spence describes him thus: "Of fine stature and handsome features, clad in splendid armor and mounted on a richly caparisoned steed, he attracted not a little attention..." (Dottore Gianni LOVES the phrase "richly caparisoned steed.") This mysterious knight commanded as much interest from the women at the event as Guta had with the men. But the knight had eyes only for Guta. And for once in her life she blushed! The knight overpowered all other contenders, easily won the tournament, and then rode over in her direction, bowing his lance to her. She blushed again, and dropped her glove, which he picked up. It seems the stranger had won a heart as well as the tourney! At the ball afterward Guta's brother asked the knight to visit them at Gutenfels, and so he did, much to Guta's delight. On his visit he told Guta that he must not tell her his name, but he would return in three months to claim her as her bride. She responded that she would be faithful; even if "a king should woo me, I will be true to thee." Three months passed and he did not return. Guta feared that he might have forgotten her, or worse, been killed. Finally, six months later, a grand cavalcade appeared at Burg Gutenfels, and a herald demanded that Kaub must open its gates for Richard, Emperor of Germany. Richard entered, immediately asked Guta's brother for her hand and the brother ran up to tell his sister that the Emperor wanted to marry her. She refused of course, as she was waiting for her mystery knight and remembered her pledge - "not even a king..." Her brother brought the bad news to the Emperor who lifted his visor and asked if the brother knew him. The brother gasped. It was Guta's mysterious knight! Richard gave the brother the glove Guta had given him, and asked him to give it to her, and to tell her it was from a poor knight in the Emperor's company. She came running and was startled to see her knight...the Emperor! Within a week they were married, she became Empress, and apparently they lived happily ever after. It's true - every word! Or is it? If you believed the story you may also believe that Richard named the castle where Guta had grown up Gutenfels which means the rock of Guta. The End! 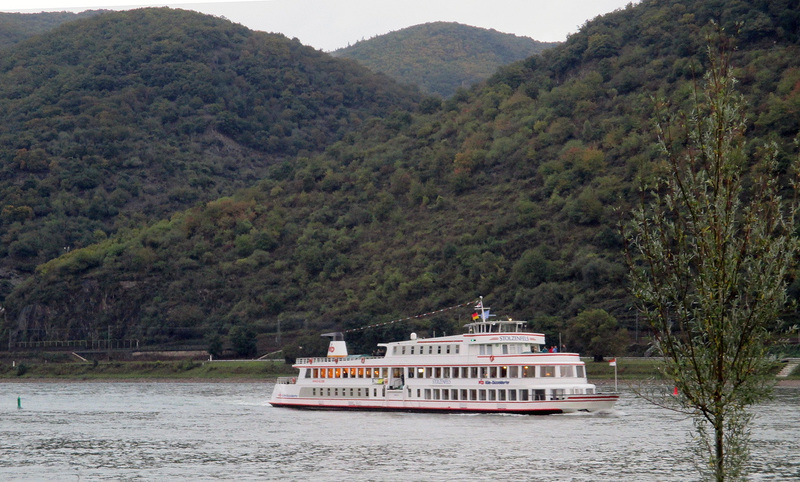 Back to my cruise, which stopped briefly at Kaub, then continued up the river making a few other stops on its way to St Goar, one of them at Oberwesel. This town boasts Schönburg, a castle dating from the twelfth century, and a beautiful Catholic church, the Church of our Lady. 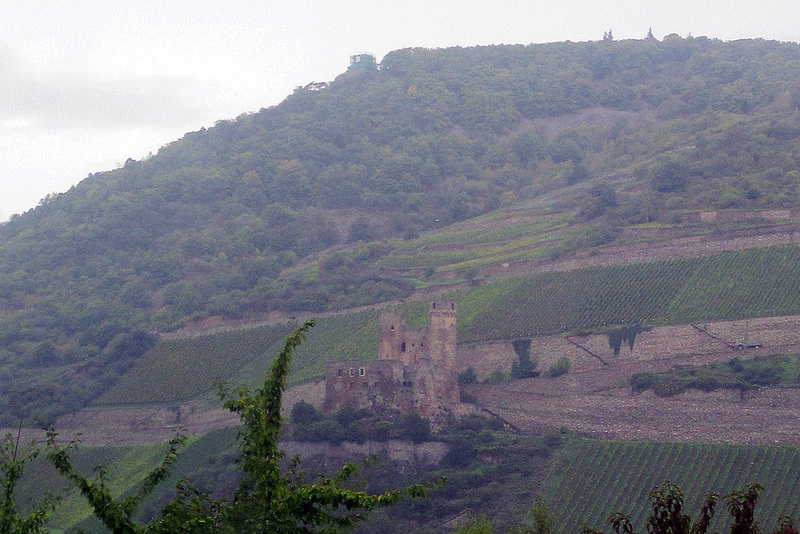 Burg Schonberg stands imposingly over Oberwesel. On the right is the lovely Pfarre Kirche Liebfrauen (the Church of Our Lady). Now a successful hotel and restaurant, the castle is also connected with legend. Briefly, I'll summarize one relates to seven beautiful sisters, daughters of a very wealthy noble. These sisters were wooed by many, many men, but they were vain young women and rejected all proposals of marriage. One day a group of young nobles decided to force the issue by confronting the sisters in their finest clothes and demanding that each of the sisters agree to choose among them and marry. The sisters, who were offered this proposal by one of the knights, were amused by it, and surprised the fellow by saying that they agreed to the it! The men were to wait briefly however so the sisters could be given a little time to dress themselves in their finest attire. The men waited patiently at a hall in the castle, but as time passed no sister appeared! One of the men happened to glance out at the Rhine and spotted the women escaping in a boat. He shouted to his fellows and all of them craned their necks to look out the castle windows to see the sisters laughing at them. In fact one of the young ladies stood up in the boat and shook her fist at the angry suitors. Alas it was a light boat and the sudden movement caused it to capsize. None of the sisters knew how to swim, and their laughter turned instantly to screams for help, but before any could arrive the swiftly flowing river dragged them to their deaths. Near the place where the drowning occurred there are seven rocks, only visible at low tide. Since that tragic event, even to this day, people claim to have seen seven lovely young apparitions there, singing sad songs! After Oberwesel my cruise passed, with much ado, a rock famous for another young female chanteuse, the above mentioned young woman of Bacharach...of whom you'll learn later. And the boat finally docked at St Goar where I left it. 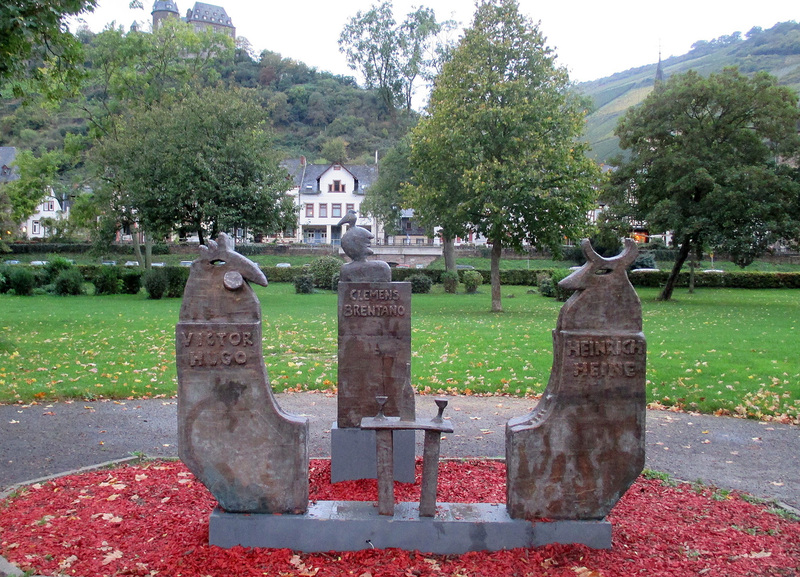 Legends abound of St Goar, one of which concerns the man for whom the town is named. The castle overlooking St Goar is Burg Rheinfels, said to be one of the most atmospheric of all the castles on the Rhine. At its foot once stood a little cell, long ago the home of the pious hermit who became St Goar. The historical St Goar arrived in area in the sixth century from Aquitaine, intent to convert the local population, who admired him at first not so much for the Christian stories he told them, but for his tending of the sick and downtrodden among them. He also offered aid to distressed mariners who had been caught by a dangerous eddy in the river called the Sand Gewirr, all too often the death of men sailing down the Rhine. In fact it may well be from this eddy that St Goar got his/its name (at least so Spence implies in his book). The holy man's reputation grew and he was soon invited to the palace, but shortly after his arrival he became sickened by the petty intrigues and machinations of the court, and told the ruler that he wanted to return to his little village. When he was preparing to leave he threw on his cloak, which happened to pass over a sunbeam. When it did it was suspended on the beam, "as though the shaft of light was solid." Everyone marveled, except St Goar, who knew that the small miracle had been prompted by divine inspiration. He left the castle and returned to his hut and the simple life. When the saint died other hermits gathered there, forming a monastery. 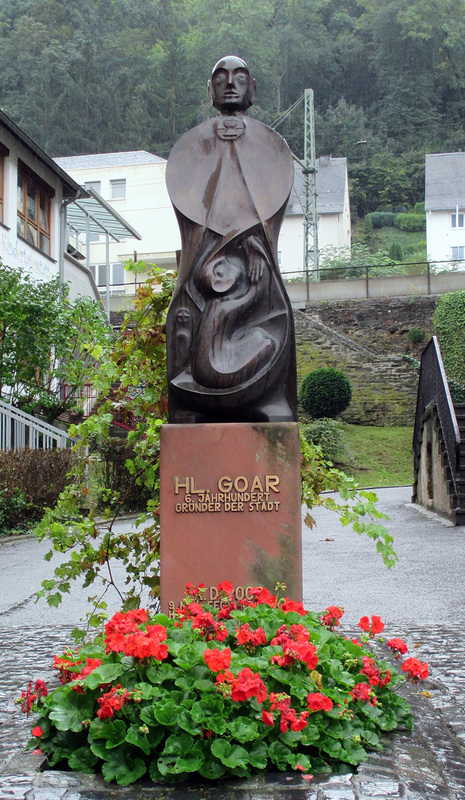 Statue of St Goar in, where else? Speaking of storms, the rain on the day of my trip had not ceased. Would that I had known the story I just told at the time - a miracle might have happened! 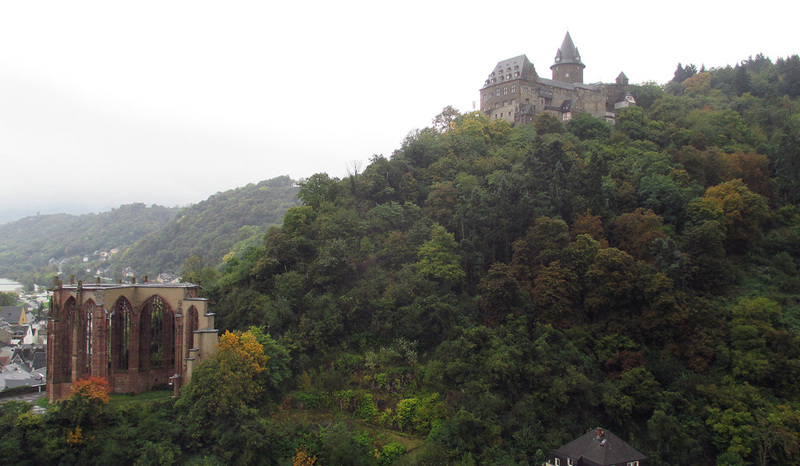 I persevered, walked towards Burg Rheinfels but could not find the little train that takes one up to it. So I made my way to the rail station, noted the time of the next train (not soon enough for me), wandered the streets for a bit, getting soggier and soggier, then took myself back to the station to be sure I'd catch the train, and also to attempt to dry off a bit. From there I headed back, not to Bacharach but a bit farther down the tracks to Bingen. 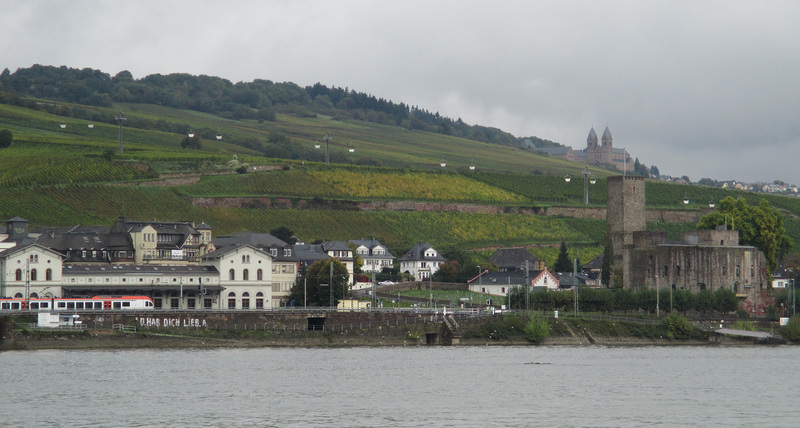 The day was still young and I had only the one day to see that town and Rüdesheim, across the river from it. I shook off my frustration (well, some of it) and charged on. describing it to her scribe. 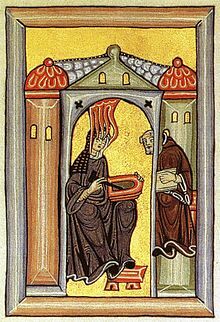 primarily features Hildegard (died 1179) who as a very young child began to experience visions, became a nun and ultimately an Abbess. In this way she was freed from the lowly status and oppression that most women at that time suffered. At the abbey she was able to do as she pleased, and it pleased her to compose beautiful music, even a play with music. Much of her work has come down to us. Whenever I want to relax I play the album of her work called "Canticles of Ecstasy" - in fact I'm playing it as I write this post. I used to have another of hers, that one titled "A Feather on the Breath of God" - sad to say I cannot locate a copy of it. I'm not a religious man (nor is Dottore Gianni), but one doesn't have to be a believer to appreciate the beauty of those titles. I love the music, but even those who do not can't deny the poetic album names. This impressive woman also a wrote Ordo Virtutum, a play with music, named by some the oldest extant morality play. I will end the description here, as I could go on and on about her - if I've whetted your interest, have a look at her extraordinary life. Now, having built my readers up, I must confess that I got lost and could not find the museum! Had I more time there...ah well, the fact is, I did not. He set fire to the barn and burnt them all." For the rats had eaten it out of the frame." Such numbers had never been heard of before." Not Southey's best poetic effort, I fear, but you get the point. And I hope you're not eating while you read this! Thwarted in Bingen I caught the car ferry across the Rhine to Rüdesheim. I knew of the place from my USAF days, when we drank a popular wine called Rüdesheimer Rosengarten (along with barrels and barrels of beer!). I had booked a hotel there before deciding to stay in the more authentic Bacharach. Rüdesheim is now, sad to say, a fairly tacky tourist trap, built to look medieval, and while there are several surviving landmarks from that era, much it is a sort of Epcot-ization of old Germany - nothing against Epcot, but why go all the way to Europe for that? 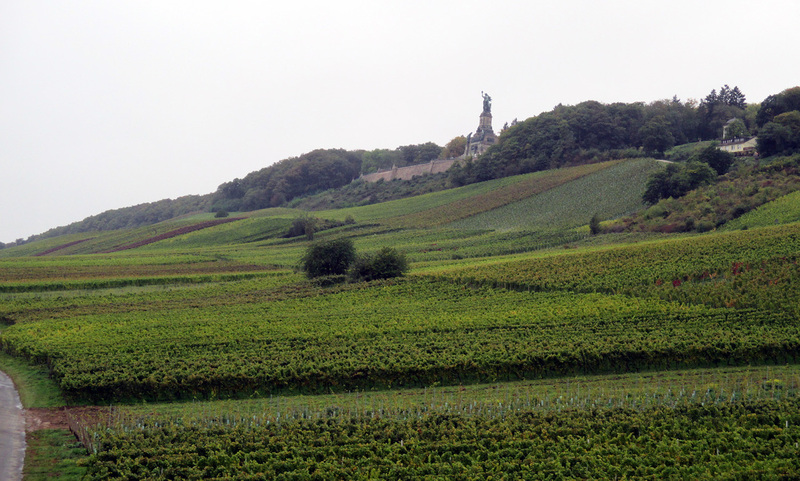 On the hills around Rüdesheim, however, there are wonderful vineyards, near which, by the way, stands the Abbey of St Hildegard. Johann Wolfgang von Goethe, the great eighteenth century writer, wrote of them in September of 1814. "The steep pathway ...led through the most splendid vineyards, clothing the hills that crowd upon one another here, in the freshest of green, and moreover in such regular stripes that they look as if covered by a curiously-wrought carpet." This is what Goethe had in mind when he wrote about his walk through the vineyards. He would not have seen the monument atop the hill, the Niederwald Monument, as it was not built until the late 19th century. It was on (or above) these hills that I had an adventure of my own, after lunch that day. 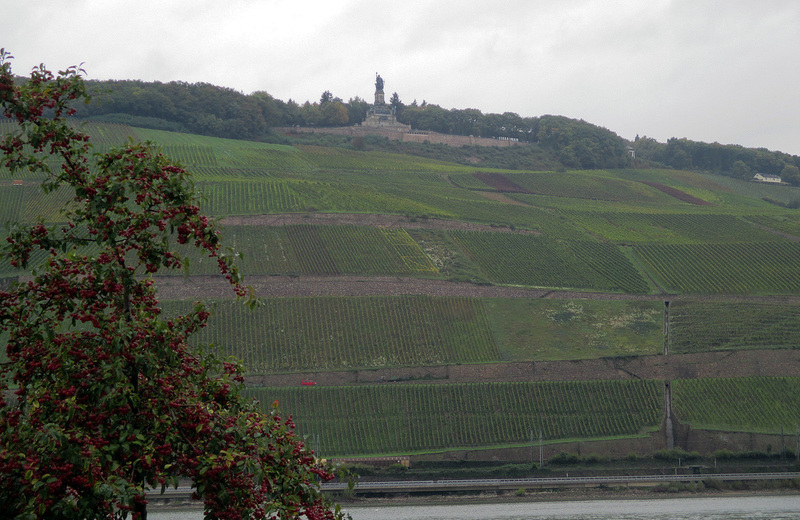 There are legends of Rüdesheim in Spence's book, but to hell with them! 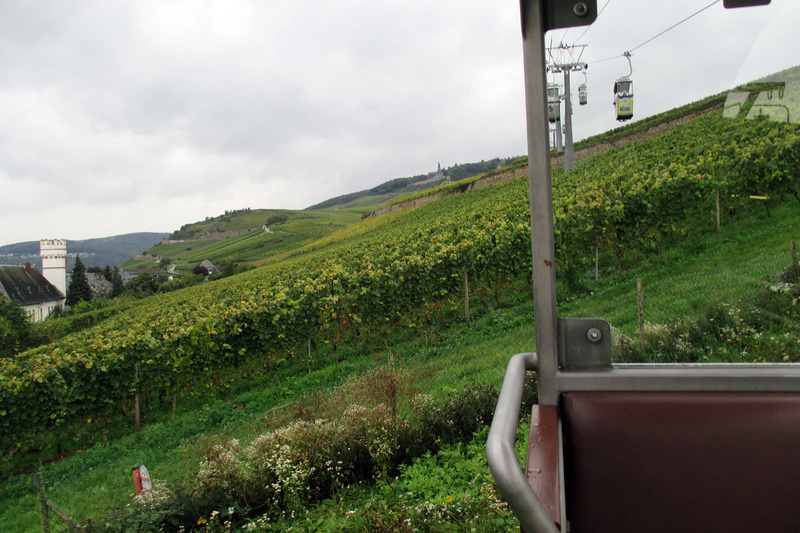 I'm telling mine instead: The Legend of Dottore Gianni and the Seilbahn. Bacharach. And I did! But only after a bit more drama. I made my wet way to the cruise line office, having seen that a boat would arrive in a few minutes, and bought a ticket. But the attendant told me that this was not the right dock, that it was two docks down. So I hoofed it as quickly as I could and JUST caught the boat. But it was an hour's journey by water to Bacharach and I feared that I would get sick from sitting, soaking and cold. So I got off a few minutes later at Bingen, raced to the rail station and, drenched, caught the train to Bacharach instead. I was there in ten minutes. 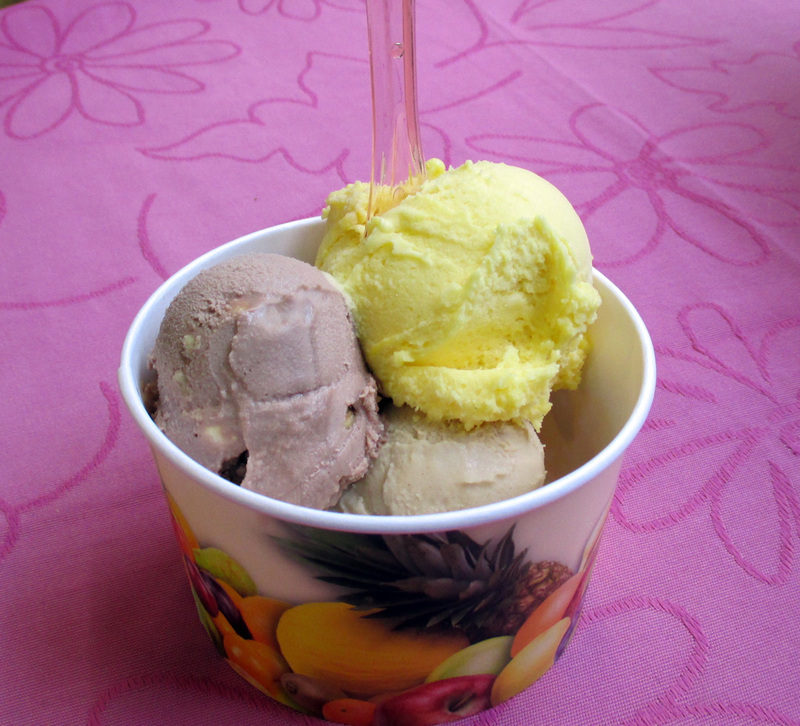 Wet as I was, tired as I was, I passed a gelato shop, stopped, and walked in, ordering what proved to be some of the tastiest gelato (three flavors, yum) I have ever had. Finally I got back to my hotel, took a hot show and had a long nap. So MY tale is told, and a soggy one it is! whole hazelnuts - quite a treat, even on a chilly, dank day. Having offered my readers a few examples of Rhine legends and lore, and one of my own, I must say that having read a book-full of them, not many legends were all that impressive, in fact you might think and I might agree that not all the ones I've just related are terribly exciting (even my own!). 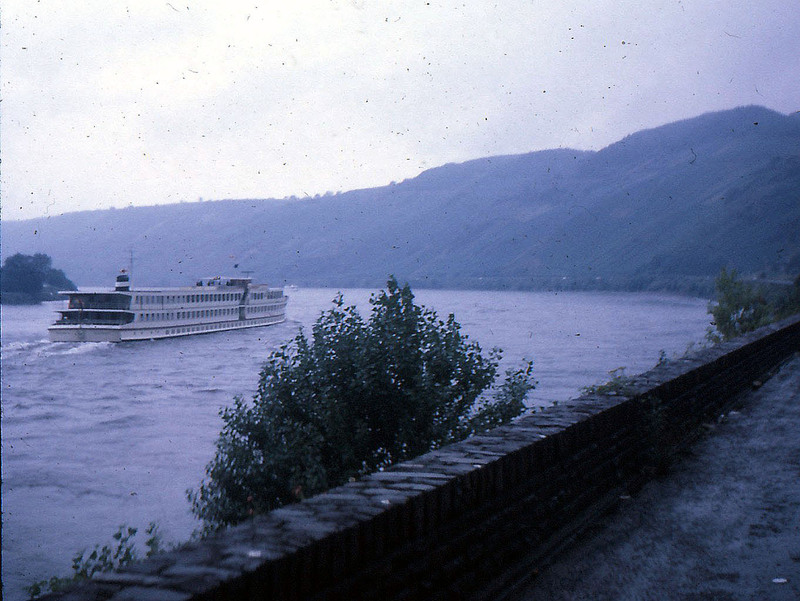 But there are two legends associated with this stretch of the Rhine that stand heads and shoulders above the rest. The first and older of the two is The Nibelungenlied (The Song of the Nibelungs), the ancient epic of Germany, comparable to (though not, in Dottore Giannii's opinion, as brilliant as) the Iliad and the Odyssey. I don't intend to go into it here, as this post is already becoming long, and telling the ancient tale would make it "epic" in length, but the city of Worms, just up the river from this romantic stretch of the Rhine, is referred to frequently in the lied as the center of the Burgundians (who became known as Nibelungs - in fact in Worms there is a museum dedicated to the saga) and Richard Wagner set portions of the first and last operas in his Ring Cycle (Das Rheingold and Die Göttadämerung) in this region of the Rhine. Wagner mixed freely the lied and some of the Icelandic and Scandinavian tales that are all bound up in this northern mythology. Any and all of them make for good reading, if you're up for it - and you should be, Dottore Gianni whispers in my ear as I write. 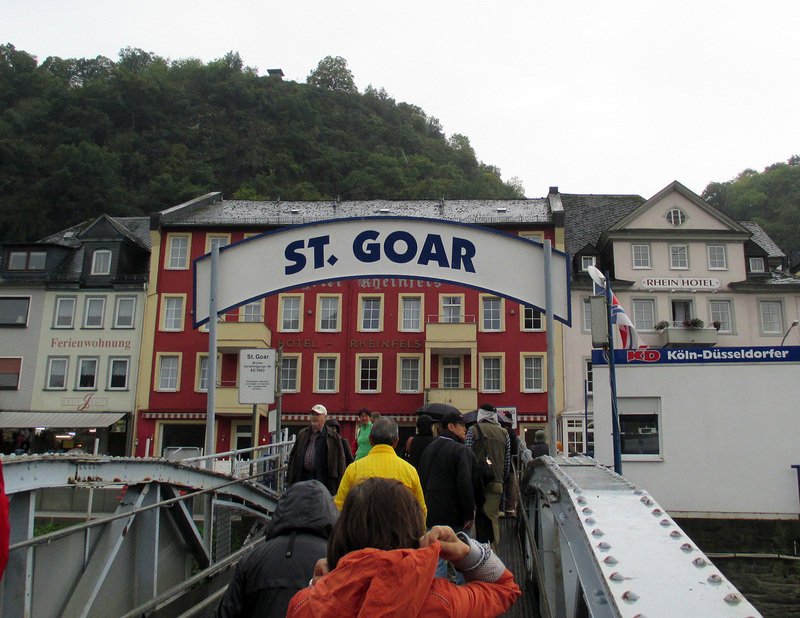 The second famous legend takes us back to St Goar. 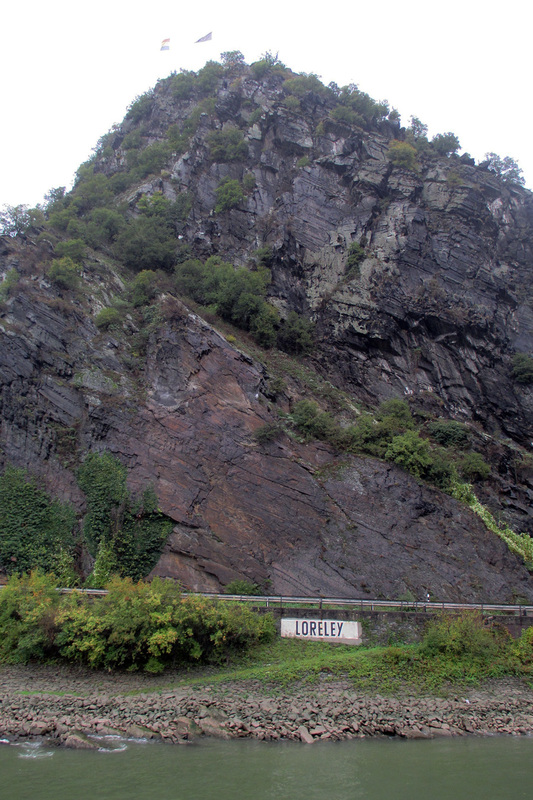 It is this legend I've been teasing you about (that of the young woman from Bacharach), and it is supremely important to the exact section of the river on which I cruised: The Lorelei, or the Lorelay as the Germans spell it. The earliest version of this tale involves an undine (or ondine, in either spelling a water nymph) who sits atop the rock of that name and combs her long tresses while singing haunting melodies. The rock is situated just upstream of St Goar, in the deepest and one of the most treacherous parts of the River and under the best of conditions sailors have to be very careful as they steer through it. Lewis Spence claims that the nymph sings in order to catch the attention of the sailors who, entranced by her, crash into the reefs and drown. Whether she does it on purpose or simply does not care - "what fools these mortals be" - matters not, I suppose. An early version of the story concerns a tough old soldier who, in order to avenge the death of a prince who has been caught in the whirlpool, leads a party of men to the rock to seek out the Lorelei and destroy her. And in their search they do indeed come upon her as she sits at the edge of the precipice. The soldier speaks, telling her that he and his men will cast her into the Rhine, but as he and his men gaze upon her a spell falls upon them. The men bewitched, Lorelei cries out, "It is not I who go to the Rhine - the Rhine will come to me!" She calls out to her father, Father Rhine, the god of the river, a wild storm breaks out, three huge white waves foam up to the top of the rock and Lorelei steps into them as one would onto a chariot and is whirled out into the stream, disappearing beneath the waves. The men feared for their lives as the storm threatens to engulf them, but as the undine slips into the river the spell on them is broken, the waters subside and the men are saved. Never again, however, would they attempt to capture the Lorelei. And nor would Dottore Gianni! 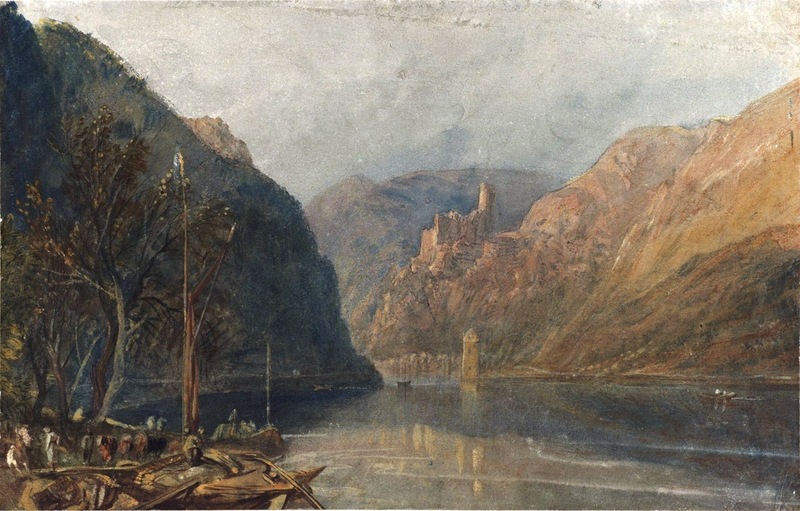 JMW Turner helps us visually again, this time with a painting of the town of St Goarhausen, opposite St Goar, and the castle above the former, Burg Katz. Much later the 19th century the German poet Clemens Brentano wrote a poem representing a later and quite different version of the story. 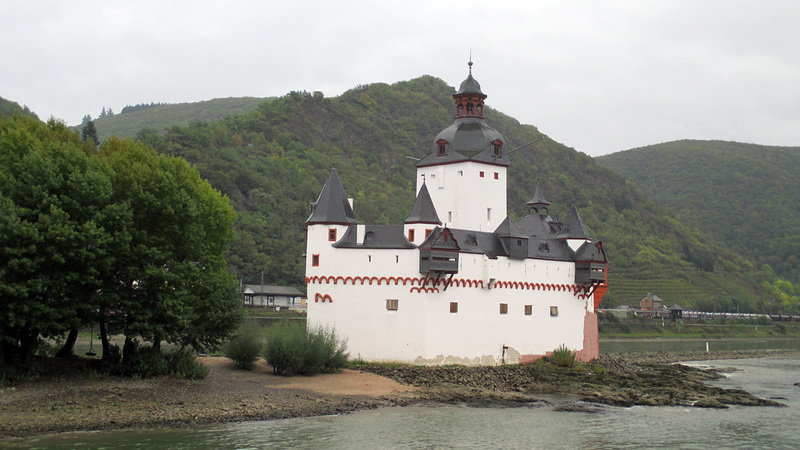 HIS tale tells of a beautiful young maiden who lived in Bacharach in the medieval era. Every man who saw her fell in love with her and many came to ask for her hand in marriage, but every one of them was sent away. The disappointed lovers wandered broken-hearted through the forests, some taking their lives by plunging into the Rhine. Unlike the nymph of earlier legend, this young woman was not callous and unfeeling. She had secretly pledged herself to a young knight who loved her, but had ridden away to fight, perhaps in the crusades. Years went by and he did not return, but still Lorelei remained faithful. 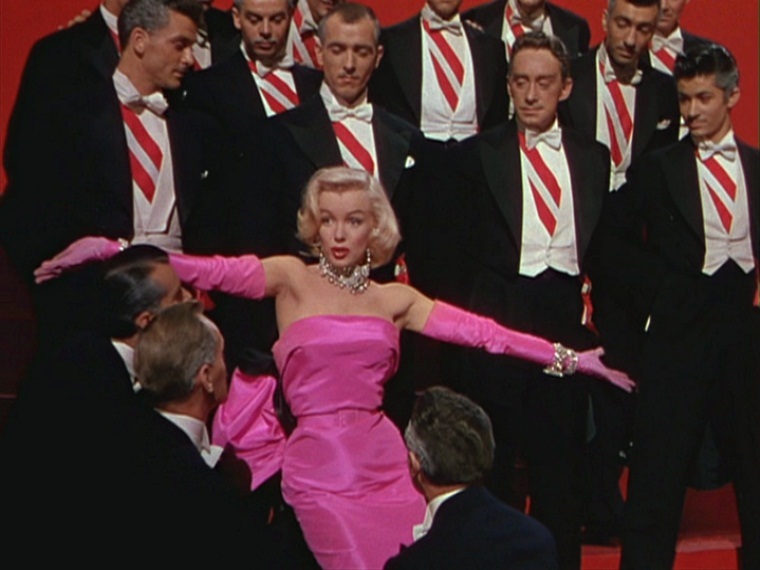 But the suitors kept coming and after a time it was rumored that the maid from Bacharach was an evil sorceress. Penalty for witchcraft in those days was death by fire and she was summoned to court by the Archbishop of Köln. When she appeared in court she stunned the judges with her beauty (even the old archbishop tsk,tsk). She told of her long lost lover, and asked that she might die, as she was responsible for broken hearts and deaths, but the archbishop told her that instead she would be taken to a convent where she could live in peace. 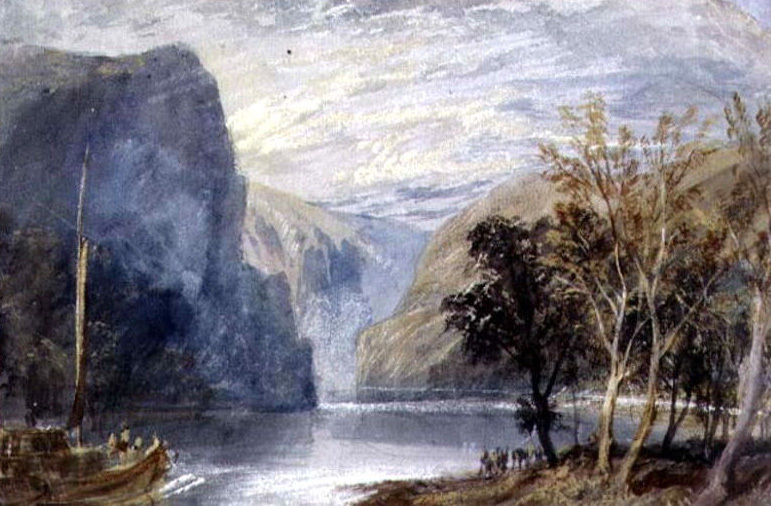 Three knights conducted her to the convent, and on their way they passed the Lorelei rock. There the young woman asked that she be allowed to climb the rock, so that she could have one last look at her knight's castle from the height. She quickly climbed the rock, saw the castle, and at the same time spied a ship sailing down the River - in the bow her knight! She cried out at the very edge of the rock, the knight and the mariners looked up, lost control of the boat and it crashed onto the rocks. Lorelei then leapt into the Rhine. As Spence puts it in his telling of the tale, "nothing more was seen of the lovers; together they sleep the sleep of death beneath the waters of the Rhine." Up there, so wondrously fair. Was done by the Lorelei. That is the original version of the first four lines of the poem I quoted in English above. For some reason, Asian visitors more than any others have taken this legend to heart. In fact as the boat approaches the Lorelei an announcement is made preparing the viewers in four languages: German, English, and two Asian languages. It's beyond my skill to recognize either of those two, but I'm guessing Mandarin and Japanese. And THEN, just as it is passing the rock, the song of the Lorelei is played - pretty hokey, but the tourists loved it. Some applauded, others sang along (poorly) with the song! I must confess that I caught Dottore Gianni humming a bit of it himself. 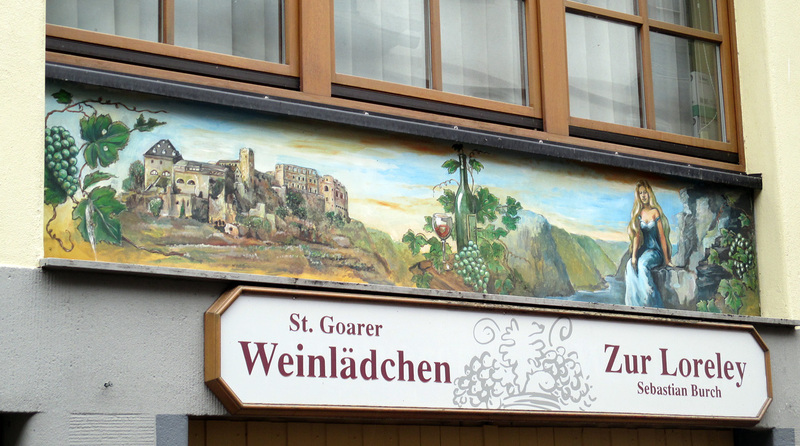 A wine shop in St Goar, clearly displaying its connection with the Loreley! I'm entranced, I admit it - and so is Dottore Gianni! 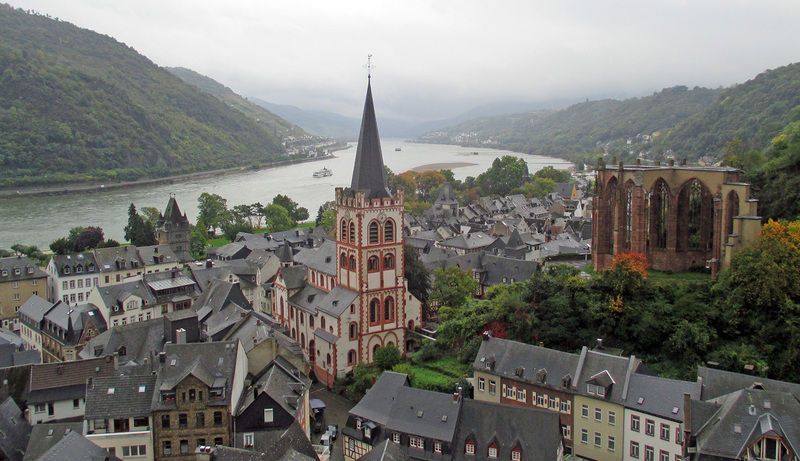 It's a fine way to honor Hugo, who wrote rapturously about Bacharach and this stretch of the Rhine, and the two poets who wrote Romantic versions of the story about the girl from Bacharach. 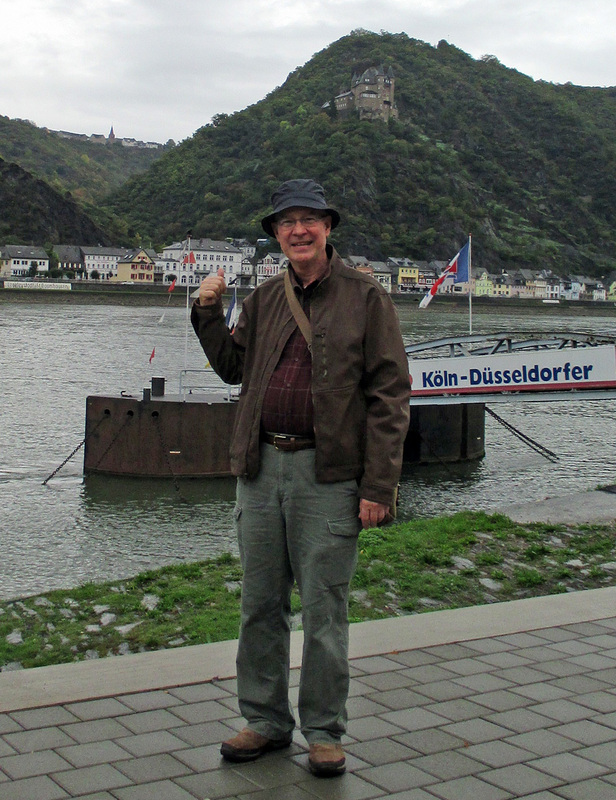 I could offer you many more tales of the Rhine, as they seem endless, but I think you've got a taste of them now, as well as of the few days I spent in beautiful Bacharach on the River Rhine.